My third pair, the first developed a split after 10 years. Not bad! Bought these for my daughter and already have two pairs of my own. She loves them in suburbia, and I use mine every day on acreage. They are always at the back door. Just love them, and now my husband wants a pair. I already have a pair of sloggers and I use them everyday. I live in an area of red soil and they are always filthy. However, they are easy to clean and I couldn’t do without them. These are extremely comfortable and perfect for slipping on and off for my frequent trips to veg patch, chickens etc and keep my feet dry through any mud and wet grass. Other versions I’ve tried have just the rubber upper and a hard inner sole, but these are much more comfy for long periods – like wearing your favourite slippers to do the gardening! They will probably last for years so might be 5 stars for value – get back to me on that one! 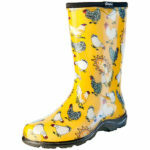 I love my new sloggers and wear them in the vegetable garden. 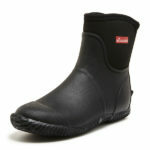 They are sturdy and well made and the innersole can be removed for washing. Highly recommend these and my friend is very happy with the plum pair I found were a bit tight for me (I later bought a black pair slightly larger). This is my second pair as I just love the originals which are as good as new after 3 years but always seem to be at the ‘other’ door. They’re so easy to slip on when just popping out for a moment and so comfortable that I have found myself at the shops whilst still wearing them. These trendy bright red Sloggers made the perfect gift for a gardening fanatic who pops in and out to the muddy veggies several times a day. 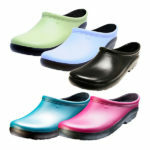 Great comfortable clogs, fast shipping and very helpful customer service.